So it finally feels like Summer may be upon us. Well, we may not be having beautiful sunny days one after the other in England, but I can always feel Summers arrival when I start leaving the house without a coat, sleeping with the window open, and when my skin starts to feel a little more dehydrated than usual. I have said before, and always will, that keeping your hydration levels up in warmer weather by drinking lots of water is vital. I drink no less than two litres a day, and I can feel the benefits in my skin. However, sometimes drinking water alone isn't enough. Increased exposure to the sun, changes in temperature and humidity, the polluted city air, and the use of air conditioning units pretty much everywhere I go, contribute to the drying out of my skin, leaving it thirsty for something more. By introducing hydration boosting products into my daily skincare regime, I manage to keep on top of all the obstacles trying to dry out my skin. I was first introduced to Clinique's Moisture Surge Range back in January this year. 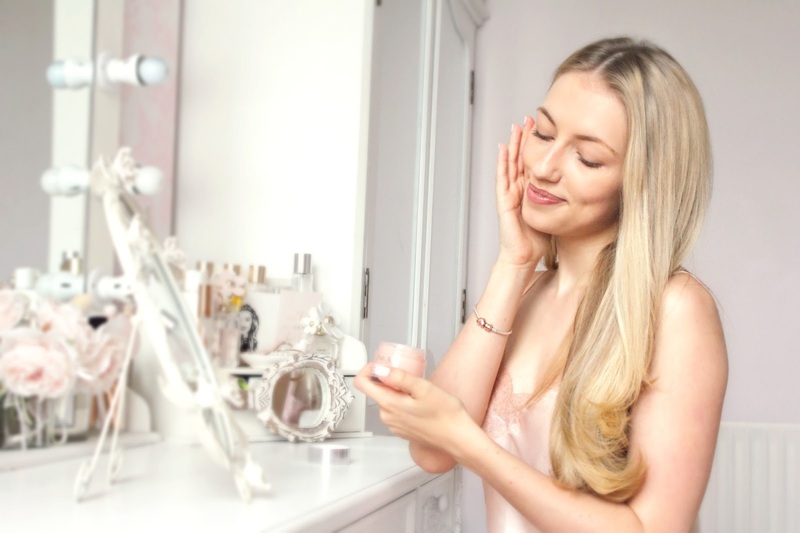 As a beauty blogger I sample a tonne of skincare products, but have found myself repeatedly reaching for the following products recently, as I love how instantly refreshed, supple and hydrated my skin feels afterwards. I start by applying the Clinique Moisture Surge Extended Thirst Relief to my face, neck and décolletage in the mornings, after I've cleansed. Sometimes I apply it over my regular moisturiser, to add extra hydration and help lock in moisture, or sometimes if I'm in a rush or don't want to use too many products on my face, I'll use it alone. After using this, my skin feels immediately quenched. The gorgeous cream-gel formula is unbelievably lightweight and instantly absorbs into the skin. You know how some products leave your skin feeling heavy and almost sticky? After using this, you can't even tell that you've used any product at all, except of course that the skin is beautifully soft and supple. The formula feels so amazing that applying it actually becomes a little addictive! This is actually an updated version of the original Thirsty Skin Relief, with all the primary benefits, only enhanced to deliver hydration faster and prolong it further. The result leaves me with gorgeously soft, hydrated skin, giving me the perfect base for makeup. Dry skin = patchy foundation and nobody wants that! It's also perfect to pop in your handbag and apply over your face during the day when your skin feels a bit tight- the relief is much the same as drinking a nice, cold glass of water when you're thirsty. Oh and speaking of cold, try popping the cream in the fridge before you use it- you'll never have felt so refreshed! 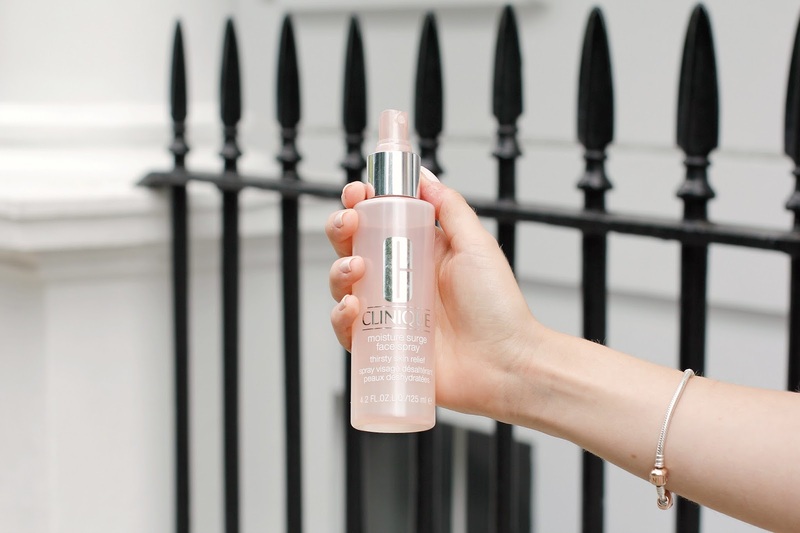 When I'm out and about in London during the day, my skin often needs a little pick me up. There are many facial sprays out there, but many leave skin feeling sticky and clammy, and lots are just plain water, which give an instant relief from dehydration, but don't penetrate the skin to really retain the moisture. 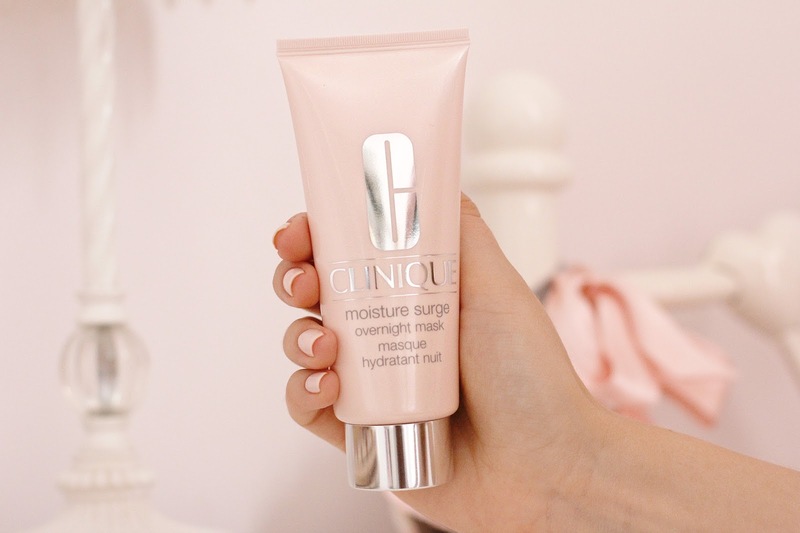 The Clinique Moisture Surge Face Spray is essentially a liquid moisturiser in a spray bottle. Unscented and oil-free, the ultra fine mist absorbs super quickly (like, ten seconds!) 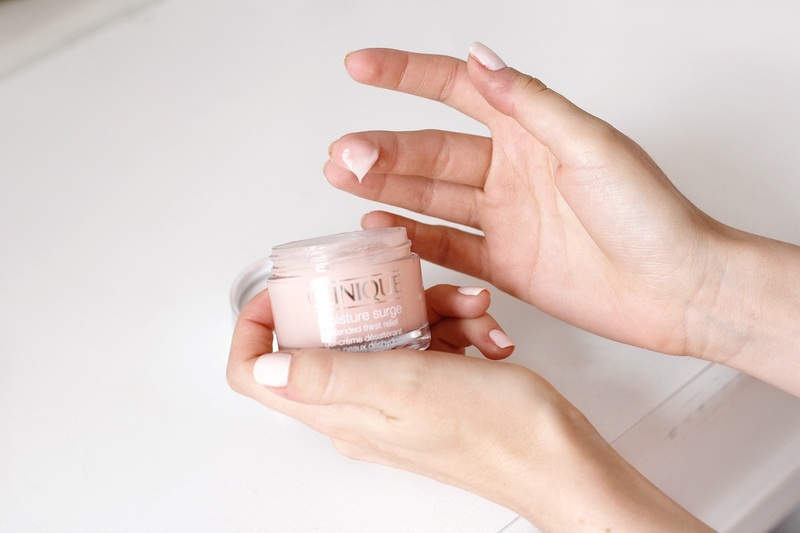 into the skin with no residue, and doesn't affect makeup at all, so it's the perfect quick fix for on the go when your skin is feeling thirsty. For the last couple of months, the Clinique Moisture Surge Overnight Mask has had a staple position in my evening skincare routine. I like to cleanse my face very thoroughly to remove all makeup and dirt from the day, which leaves my skin feeling horribly dry and tight. I love smoothing on a generous application of this gorgeous, creamy mask. Is there a nicer feeling than going to bed with beautiful clean, soft skin? And on top of that, actually waking up with clean soft skin? I never wake up with a dry, dehydrated face after using this, as it hydrates so deeply into the skin. Fragrance and oil free, it's amazing how moisturising the product is, whilst still avoiding being heavy or sticky on the skin. I use this every night, to make sure my skin is always plumped and supple (no one wants to be dry and wrinkly!). Hydrating your skin will not only improve it's current condition and appearance, but also help tackle premature ageing, so I always pay a little more attention to massaging areas that are more prone to dryness and therefore wrinkles, such as my forehead. As young ladies in 2016, we put a lot of strain on our skin, so it's important to replenish the moisture lost in our busy day to day lives. 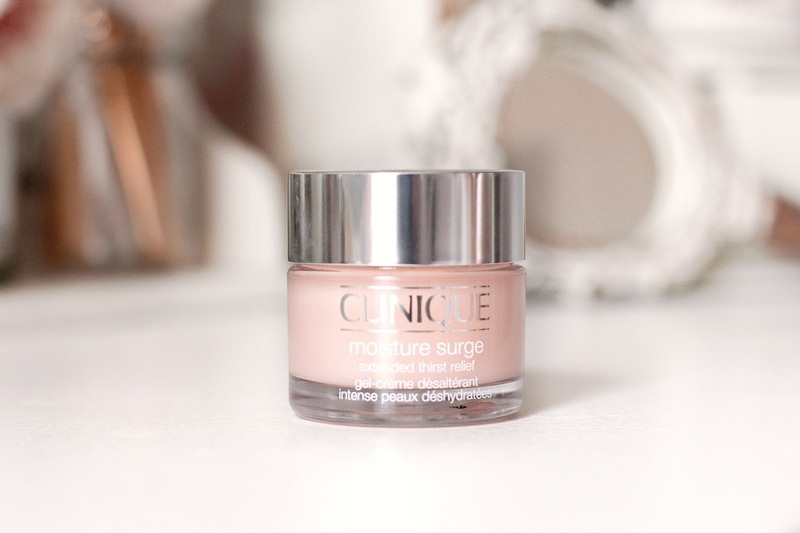 I would absolutely recommend the Clinique Moisture Surge range as a total staple for skin hydration. Remember, it's not only you that needs a drink when you're thirsty- it's your skin too! This post was kindly SPONSORED by Clinique. Find out more about the way I work with brands here. I bought that product too and its fantastic! I LOVE IT ! I really wanna try all of these products! They sound so amazing! That packaging looks like it was made just for you! Thank you so much for sharing! I have been trying to find the right product for my very sensitive skin, this may work! Living in AZ during the summer on days when it hits 120* nothing helps! Great work! I really want to try the Clinique Moisture Surge Face Spray! Sounds fabulous! That facial spray sounds great, I have been on the hunt for a new one and think this could defiantly be the one, thank you! ps. I love your blog, its beautiful!